Born in London in 1834; nothing is known about his origins and upbringing other than that his father was a stall merchant. After studying at Leicester Baptist College, in 1856 he became minister of a Baptist meeting at Hugglescote, Leicestershire. However, the following year he moved doctrinally and geographically to liberal non-denominationalism in Birmingham. In 1860 Hopps became minister at Upperthorpe Chapel, a new Unitarian congregation in Sheffield, moving on to Dukinfield and then the St Vincent’s Street Chapel, in Glasgow, where he was also elected to the Glasgow School Board and was a prominent advocate of secular education. In 1876 he was appointed to the Great Meeting Leicester, by then one of the most prominent Unitarian congregations. In Leicester between 1880 and 1886 he ran Floral Hall as an unconventional means for spreading the Christian message, attracting very large numbers of working people through flowers, music, and popular preaching. Politically he was an advanced Liberal, a strong supporter of Irish Home Rule (a position that was unpopular with his Leicester congregation), of land reform, of anti-vivisection, and of the peace movement. Among other things Hopps ran for Parliament in Paddington as a Radical Liberal against Lord Randoph Churchill in 1886 (the year of his Lit and Phil presidency) but was heavily defeated. Rejecting belief in the resurrection of the body, he was also an early advocate of cremation, organising a wide-ranging discussion meeting on this during his year as President of the Lit. & Phil. and during the same year he gave a lecture on another controversial personal interest, Spiritualism. In 1892 he left the Great Meeting because of continuing tension with his congregation, and he left for the Free Christian church, Croydon, where he remained until 1905, moving then to Little Portland Street Chapel and on its closure to University Hall in Gordon Square. In accordance with his long-held beliefs his funeral service was at the Woking Crematorium. 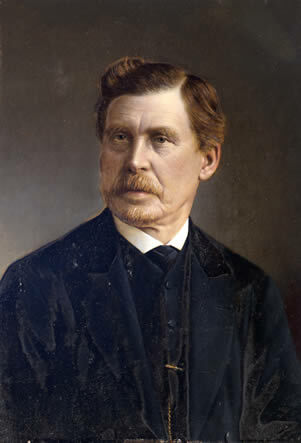 His son, John Alfred Hopps, was President of the Lit. and Phil. for 1918-19. Other Publications: Hopps wrote and published many sermons, hymns, and manuals for family worship, and also edited for long periods two periodicals, The Truthseeker from 1863 to 1887 and the Coming Day from 1891 until his death.